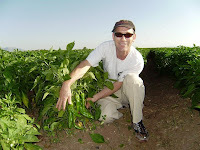 TeraGanix Blog: EM Grown Chilis. El Pinto Restaurant in Albuquerque, New Mexico is well-known for its food and friendly atmosphere. They are also known for their salsas, which are available at Wal-Mart and now at select Whole Foods Market locations with their new Certified Organic Line of salsa and enchilada sauce. 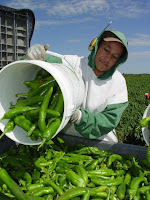 About 4 hours south of Albuquerque, the "Salsa Twins", John and Jim, have contracted with some farmers to grow Certified Organic chili peppers with EM•1 Microbial Inoculant. Last year was a rough year for many growers in the valley. High winds and hail damaged most neighboring farmer's crops. The fields grown with EM1 kept producing and the Salsa Twins didn't have to replant their fields. In all, they got about 20,000lbs per acre. The average for a conventional farm is about 25-30,000lbs per acre. According to Jim, the reason their numbers were low was because they stopped picking the peppers once they started turning red. 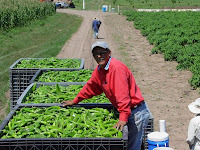 They had more than they needed for the year's salsa production and let the red ones go to other markets. Here's Jim Thomas with his "babies". He is one proud father! Below, we have a video of the growers applying Activated EM1 on the leaves of their plants last summer (2008).